Amino acids are the building blocks of protein, and are vital to understanding the Kreb Cycle. The Kreb cycle also known as the tricarboxylic acid cycle (TCA cycle), is a series of enzyme-catalysed chemical reactions, which is of central importance in all living cells that use oxygen as part of cellular respiration. There are 21 basic amino acids that produce over 1600 substances in the body. Making up 3/4ths of the body's solid material, and are found in muscle tissue, organs, blood and skin. Amino acids also make hormones, enzymes, and vitamins, and are essential for a healthy immune system and proper neurological functions. It is necessary to replace amino acids constantly to nourish the body, and repair and regenerate tissue. Amino acids are generally ingested in the food we eat, however, because of processed foods, inadequate diets, and food restrictive programs, proper balance is rarely achieved and supplementation is advisable. Especially during illness, trauma, surgery and stress more amino acids are required than can be obtained by food alone. In the chronically ill, amino acids can help reverse negative nitrogen balance, and help prevent tissue wasting. Providing a balanced nutritional program, especially for restricted food programs, including food allergies. 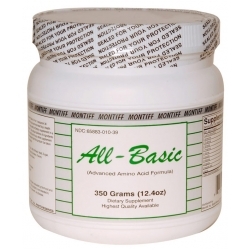 ALL-BASIC-PLUS is the recommended choice to help insure optimum balance and provide basic amino acid requirements. DIRECTIONS: As a dietary supplement, take 1/4 to 1 teaspoon 30 minutes prior to meals or as recommended by a health care professional. Other Ingredients: Contains no Starch, Corn, Milk, Wheat, Yeast, Sugar, Eggs, Salt, Artificial Colors, Binders, Flavors, Preservatives or fish derivatives.